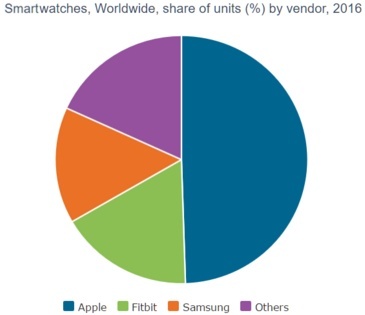 According to an estimate by research firm Canalys, Apple controlled 49 percent of the global smartwatch market in 2016, followed by Fitbit and Samsung, with 17 percent and 15 percent. The global smartwatch market is now controlled by Apple, who has a comfortable lead over its followers. Samsung, once a global leader in this sector, is now only in the third place, behind Fitbit. During 2016, more than 24 million smartwatches were sold worldwide, and Apple's Watch accounted for almost half of this figure. According to an estimate by market research firm Canalys, "the Apple Watch generated more than US$2.6 billion in revenue for Apple in Q4 2016, making up nearly 80% of total smartwatch revenue." The same source reveals that Apple managed to sell 11.9 million smartwatches, holding a market share of around 49 percent. The market share of the companies that ranked on second and third places combined is still far behind Apple. Fitbit reached a market share of 17 percent during 2016, while Samsung was quite close, with 15 percent. In the coming months, "Samsung is expected to push shipments of its Gear S3 Classic and Frontier," reads Canalys' latest report.